Mayoral candidate Toni Preckwinkle has received thousands of political donations over the years from many people – including, surprisingly, her opponent in the race for Chicago mayor. 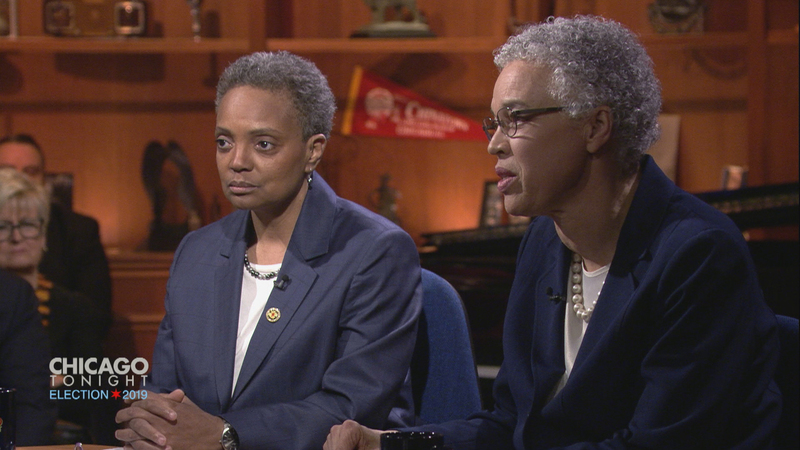 Candidate Lori Lightfoot on Thursday revealed that she gave $1,000 to Preckwinkle last year as Preckwinkle was running for a second term as Cook County Board president. Video: Watch the full forum online. Lightfoot was responding to Preckwinkle’s criticism of her role as partner at the powerful law firm of Mayer Brown, where she has defended banks against racial discrimination and Republicans who were taking on Democratic gerrymandering of maps. “She was an owner in that firm, and she personally benefitted from it,” Preckwinkle said. The back-and-forth was the latest in a series of contentious public appearances between the two runoff candidates, though the tone Thursday was more civil. Both candidates agreed on many policy points, including a push to create a civilian police oversight agency that would have the power to hire and fire the police superintendent. Both said they support a version of the Grassroots Alliance for Police Accountability (GAPA) ordinance that would create such a commission. The two differed slightly on the issue of rent control as a way to help slow the displacement of residents from gentrifying neighborhoods. Preckwinkle says she supports a lift on the statewide ban on rent control so that the city of Chicago can “talk about it.” Lightfoot said she didn’t believe it was the way to go in dealing with the issue. Both favored stronger requirements to build affordable housing throughout the city. Both Lightfoot and Preckwinkle were vague on solutions to Chicago’s pension funding crisis, with Preckwinkle alluding to her support of a progressive income tax at the state level that should benefit Chicago with a piece of the extra revenue the state takes in. Lightfoot said emphatically that she would oppose a city soda takes, calling it “offensive” that Preckwinkle had passed such a tax at the county level (it was swiftly repealed). Lightfoot also said that she would not talk about increasing large pots of city revenue until she had successfully made the case that there was no other alternative. Chicago faces the daunting task of finding $1 billion more to put into its four beleaguered pension systems in the coming years to prevent them from going insolvent. Preckwinkle opened the forum by touting the endorsement she received this afternoon from Chicago-based musician Chance the Rapper, and defended her campaign’s move to pull out of any television advertising.